A couple of weeks ago I attended a twitter chat hosted by a large, national organization. The organization had enlisted a co-host who was supposed to lead the chat. She took a lecture approach to it, and tweeted out only informational tweets. She did not interact with the attendees, or even with the twitter account for the organization, ignoring tweets and questions directed to her. At the beginning of the chat there were 75-100 people participating, after fifteen minutes had passed (and everyone realized there was no space for interaction or answers for their questions), that number fell to about 10. It was a lost opportunity for the organization, and it was upsetting for people who had made plans to stop in the middle of their work day to participate in an important conversation and resource sharing event. Twitter chats can be a great way to build community, share information, increase your social media presence, and connect with other people. They can also be a lot of fun. Do you want to run a twitter chat? Great. Pick a hashtag (short is always best when picking a hashtag), set a time, promote your chat, and show up on time. If you want your chat to be successful, I have three tips that will help you. At the beginning of the chat, you need to introduce yourself, remind people how long the chat will last, and lay out any rules or guidelines (this last one is especially important if you will be giving out prizes). Most twitter chats have a question-based format. It is up to you if you want to number those questions and spend a set amount of time on each one, or if you would like to have more of a conversational feel. Once you decide how you want to structure your chat, prepare the questions ahead of time, so you are not left scrambling for something to tweet. You should not just tweet out informational facts for an hour. This is a twitter chat, not a twitter lecture. If there are links to resources that fit in with your topic, or if you are representing a brand, you will have informational tweets as part of your chat. Make sure those tweets are followed by questions that relate to the information. There are some twitter chats that are not question-based. A great example is the #SITSSharefest chat on Saturday mornings at 10am EST. #SITSSharefest is a relaxed, fun atmosphere, with the goal of community building and blog post sharing. Attendees share their favorite blog post from the previous week, and the host retweets them. It is a great way to get more exposure for your blog and meet other bloggers. Even though it is not a question-based chat, and there are no prizes, the host will ask several questions, and start conversations throughout the hour. Depending on the amount of attendees, you might not be able to tweet at every single person who is there, but you need to make an effort to interact with as many as possible. Seeing the host answer the questions and interact with the attendees helps people to feel more free to interact with each other. Retweeting, or marking a tweet as a favorite, is a great way to show someone you were paying attention to what they were saying, and also to highlight it for everyone following the hashtag. Everyone likes to be retweeted. 3. Respond to tweets that are directed at you - especially if they ask a question. I know this tip is similar to the last one, as it deals with interaction, but it is important enough to receive its own mention. A twitter chat is like a party. Imagine yourself at a party, standing in a room full of people: If someone asks you a question, would you ignore them? Of course not. That means it is not okay to ignore them during a twitter chat, either. As much as possible, every direct question needs to be answered. If you find that your chats are getting too large, you could enlist a co-host to help. Remember those tweets you favorited? Look through them after the party. You may find someone you want to follow-up with in that list, or a question that needs an answer longer than the 140 characters you are allotted on twitter. Bonus Tip: Attend other twitter chats. You do not have to follow someone else's format; feel free to make your chat your own. Attending other chats will help you to get an idea what it feels like to be a participant, and you can pick up ideas of what works and what doesn't. Don't let running a twitter chat intimidate you. With a little preparation, anyone can do it, and have a great experience. Yes! To all of this! Well said. Love this post, Tracie! That is awful that someone just tweeted and did nothing else. That's poor for the brand when there is such a lack of engagement! Thanks, Andrea! It was a very frustrating experience, for sure. Thanks! Those twitter lectures are definitely not fun at all. The organization actually sent out a short form after the twitter chat that asked some questions, and provided a space to give feedback on the chat. I (nicely!) wrote about interaction, and gave them some ideas for future chats. I'm hoping that it helps them. Great advice! I'll have to keep this in mind, if I ever get popular enough to bother with such a thing. You never know!! I was surprised the first time I was asked to host one, but I've done quite a few since then, and really enjoy them. The weekly SITS Girls' Twitter party is the only one I have attended so far. It has been great for helping me learn more about Twitter in general, as well as the parties. 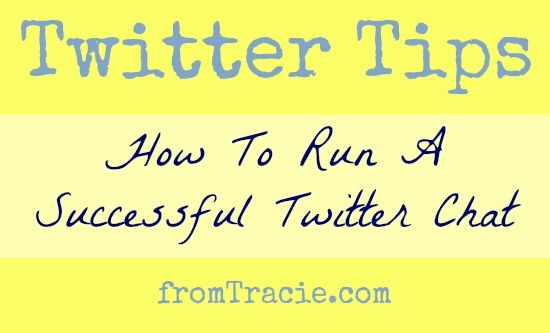 Great tips, Tracie! That party is SO much fun! I look forward to it all week. This really couldn't have come at a better time as I may host a Twitter chat soon. Thank you so very much for all these helpful tips! I'll be sure to make it as interactive as possible :) Thanks! Awesome!! I'm sure you will be a great host! I have been attending the SITS Saturday Sharefest since I started blogging (a whole month ago!) but have only tried attending two other Twitter chats. Thanks for this information- very helpful. Thanks for the tips! Twitter parties are something new that I am encountering! They can feel a bit confusing or overwhelming at first, but they really are a lot of fun. I'm shocked that some of this isn't common knowledge. But some of the tips were very knew to me. I'be been a little afraid to host my own twitter chat. You would be a great twitter chat host! I know this because you are a great twitter chat attendee, and you always pull people into the conversations. Hey Tracie you have provoked me to hold one twitter chat too!!!! Great advice, and I agree more chatting less lecturing! Thanks for the tips! I'm moderating my first Twitter chat on Monday, May 13 (#supermomsskincare) and am excited and nervous. I'll be sure to keep all this in mind! Twitter parties sound a lot like successful blogs. Interaction with your audience is key, and you definitely made that stand out in this post. Hopefully that company will come across this and realize they picked the wrong person for the job.